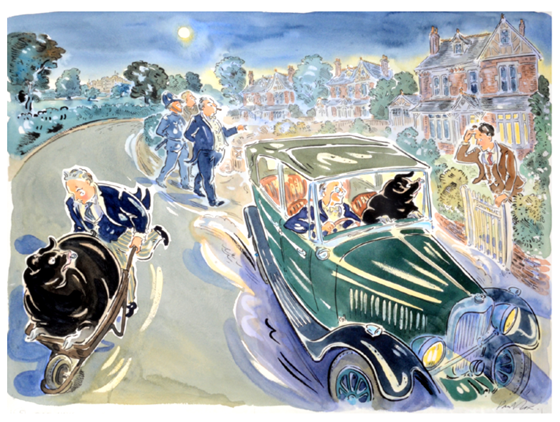 The essential collection of Paul Cox's illustrations will be showing at the Chris Beetles gallery in London, opening on Oct 1st. Paul told us that he especially painted 200 new pieces just for the show. If you are in the area or would like to be, definitely check it out. Below is the official flyer featuring the schedule and some more about Paul and his work. 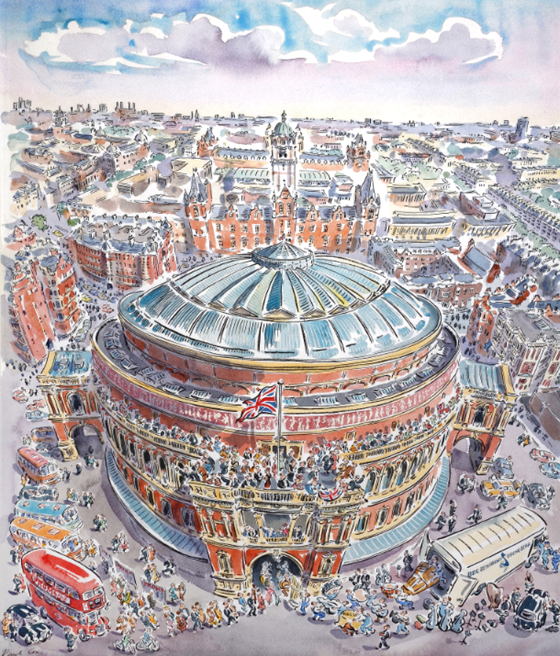 Paul Cox’s fluid, immediate draughtsmanship and vibrant colour make him one of the most enjoyable of contemporary illustrators. This major retrospective, of over 200 works, demonstrates the breadth of his achievement, and especially the geographical range of his imagery; for he is a significant topographical painter as well as both an incisive and sensitive literary illustrator and a highly versatile designer. 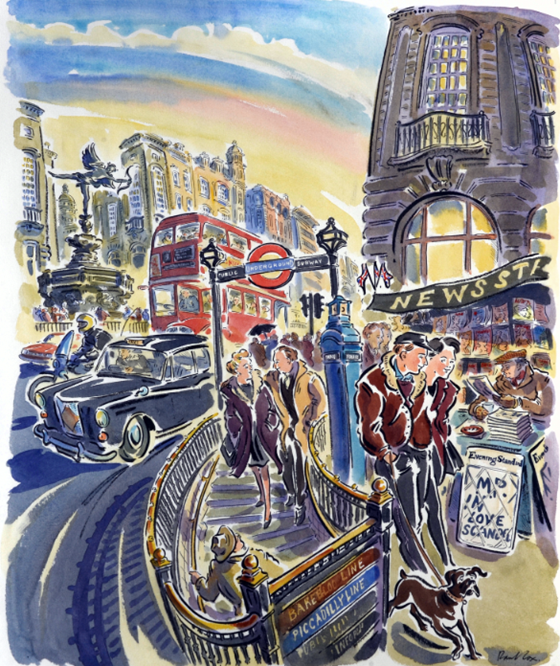 Paul loves to capture his home city of London, as is here represented by views from South Kensington to St Paul’s, many of which have been published in our leading magazines and newspapers. From early in life, he has also gained experiences beyond London, and especially the Southern counties. His characteristic vision of Britain is prosperous and peaceful, as is evident in his country house portraits for Tim Heald’s Honourable Estatesand his images of the Season from Glorious Goodwood to the Henley Royal Regatta. However, his range is broader and earthier than it first seems, as is shown in his depiction of The Barras, a market in Glasgow. 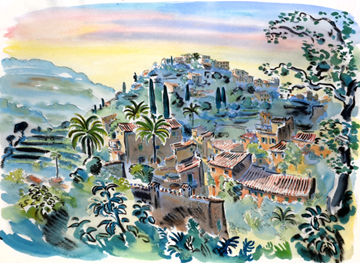 Paul has also been visiting Europe since childhood, when he made the first of many inspiring trips to Uzès, in the South of France. Since then, his European visits have concentrated on France, Italy and Spain, though commissions have led him to engage with a range of countries, from Ireland to Malta. 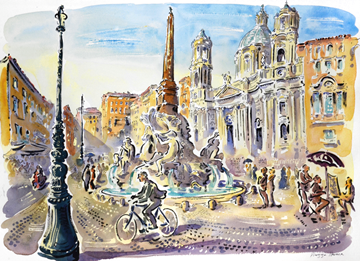 This exhibition highlights the fruits of Paul’s first ever trip to Rome, made with Chris Beetles in 2011, and these show the city as extraordinarily active, with pedestrians, cyclists and Vespa riders making the most of the theatrical settings. 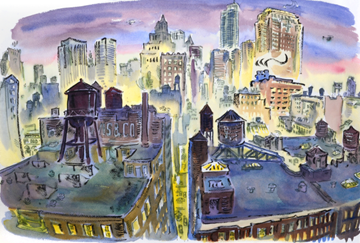 Despite his newfound delight in the Eternal City, New York remains Paul’s favourite city after London. On his first adult visit, on assignment for Blueprint in 1986, the scale of the architecture excited him and the energy intoxicated. And on each subsequent trip, the thrill has remained. Among many and varied American commissions, Paul Cox has contributed regularly to a range of magazines, including, most notably, Vanity Fair. Throughout his career, Paul has paralleled topographical drawing with literary illustration, and the two genres have informed each other. His responses to particular texts are invariably imbued with a strong spirit of place, which is often achieved through imaginative re-creation. 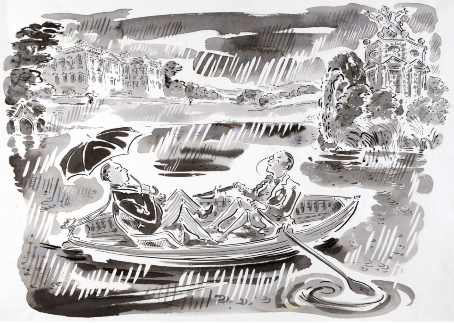 Projects represented include Andrew Gurr’s Rebuilding Shakespeare’s Globe, Jerome K Jerome’s Three Men in a Boat, and many titles in P G Wodehouse’s two classic series of novels, ‘Jeeves & Wooster’ and ‘Blandings’ (for The Folio Society). A 110-page fully illustrated colour catalogue accompanies the exhibition. 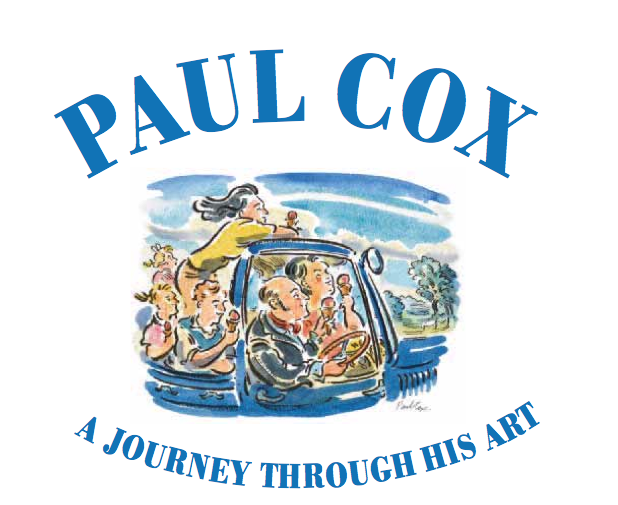 Priced at £15 (+p&p), it includes an essay by Cullen Murphy and Graydon Carter (of Vanity Fair), a chronology of life and work, and an extensive, insightful interview with the artist – which together comprise the latest and most authoritative information on Paul Cox.